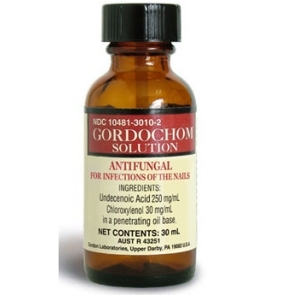 Gordochom Solution is an effective, inexpensive antifungal treatment for nail fungus in the form of a liquid in a 30mL bottle with a brush applicator. It contains as active ingredients, a natural fungicide Undecenoic Acid 250mg/mL and a germicide & antifungal agent, Chloroxylenol 30mg/mL in a penetrating oil base. 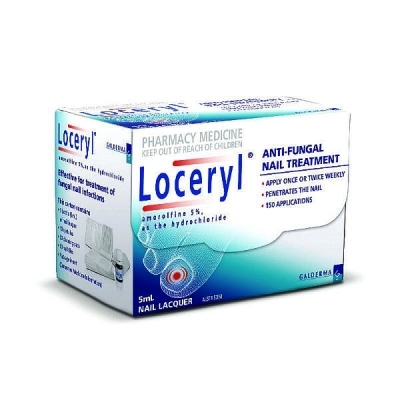 For the antifungal treatment to be effective, there is no need for special preparations of the nail surface, no scraping or filing of the previous application. It is easy and simple to use, just apply with the brush applicator to the affected nail and surrounding skin twice daily, morning and night. Compliance is important. For optimum results, it is best to not apply nail polish when treating the infected nail and allow the active ingredients to penetrate leaving no residue.